Philadelphia Union forward, David Accam says he hopes to keep his impressive in the ongoing season in the Major League Soccer as the 2019 Africa Cup of Nations approaches. The 26-year-old has been on sparkling form scoring three goals and providing two assists in four games. Accam has not been handed a national team invitation since the 2015 AFCON where he was part of Coach Avram Grant’s final squad even though he never made an appearance. Despite his impressive start to the season, the skilful winger maintains he needs to show a consistent form to catch the eyes of Black Stars coach, Kwasi Appiah. "I have started the season well and I just need to keep improving and doing better," Accam told Graphic Sports Online. "Soccer is a funny sport, I didn’t even expect to start before the season but now am starting and playing well and contributing positively to the team." "My target for this season is to be healthy, fit and enjoy playing soccer again. 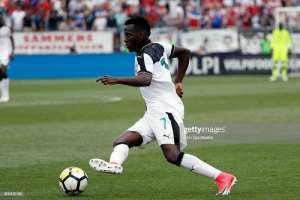 Is been difficult two years with injuries and surgeries but am feeling much better now," said Accam who has scored a goal in 10 appearances for the national team. The 32nd edition of the tournament will kick off from June 21 to July 19 in Egpyt.